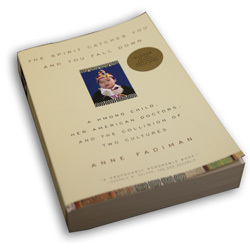 “The Spirit Catches You and You Fall Down: A Hmong Child, Her American Doctors, and the Collision of Two Cultures” is a book by Anne Fadiman. Published in 1997, it details the experiences of an illiterate Hmong family living in California and their interactions with the American healthcare and social services system after the diagnosis of epilepsy in their infant child. When Lia was about three months old, her older sister Yer slammed the front door of the Lees’ apartment. A few moments later, Lia’s eyes rolled up, her arms jerked over her head and she fainted. The Lees had little doubt what had happened. Despite the careful installation of Lia’s soul during the hu plig ceremony, the noise of the door had been so profoundly frightening that her soul had fled her body and become lost. What is a good doctor?… What is a good parent? The GSU Library has many books available to guide you on your journey to supportive treatment of all people. Read more about Lia and her family here, in her L.A. Times Obituary. This entry was posted in Anthropology, Books, Communication, Early Childhood Education, Education, Educational Psychology & Special Education, For Faculty, For Graduate Students, For Students, General News, Health Administration, Kinesiology & Health Education, Nursing, Nutrition, Physical Therapy, Psychology, Public Health, Religious Studies, Resources, Respiratory Therapy, Social Work, Sociology and tagged Hmong. Bookmark the permalink.